Movie: "Call Me by Your Name"
A 17-year-old young man falls for the graduate student staying with his family for a few weeks as he studies abroad. Love stories are a dime a dozen. Most are wholly unrealistic, and others, well, others are so painfully realistic that it hurts. 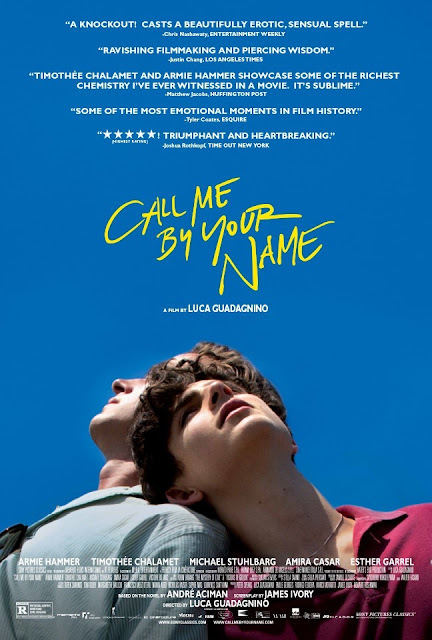 "Call Me by Your Name" is a coming-of-age tale about a young man's sexual awakening as he experiences his first true love. The film is directed by Luca Guadagnino, who is known for his other projects like "I Am Love" and "A Bigger Splash." It is written by James Ivory and is based on the novel of the same name by André Aciman. It stars Timothée Chalamet as Elio Perlman, a 17-year-old living in Italy with his parents, played by Michael Stuhlbarg and Amira Casar. Elio is highly educated, open-minded, adored by his parents, and seems to enjoy a fairly privileged life. Joining him is Armie Hammer who plays Oliver, a charming, suave, handsome 24-year-old American graduate student who has come to stay at the Perlman estate for six weeks to study under the guidance of Elio's father, who is a university professor. Once he arrives, Elio seems to slowly become infatuated with Oliver, and it would appear Oliver has an affinity for Elio as well. Over the course of the next few weeks, the two of them become quite close and begin a love affair, the first of Elio's young life. On the outside, "Call Me by Your Name" is a fairly standard, dramatic coming-of-age romance. We have seen many different movies with a similar premise. What sets this one apart from others in its genre is that it features a gay relationship. The movie focuses Elio and his sexual, sensual, and emotional awakening. This is not a movie about a 17-year-old being seduced by a 24-year-old as many misinformed troglodytes would have you believe. Instead, it is about a 17-year-old person-of-age exploring his desire and sexuality as he opens himself up to the possibility of love. Oliver is not Elio's first sexual encounter. Despite the fact that Elio has a young woman named Marzia, played by Esther Garrel, who likes him very much, he cannot escape his feelings, desire, and yearn for Oliver. The crux of the story is about the slow, sensitive, passionate development of their connection. It does not hurt that the film is set in Italy, which contains a lot of gorgeous scenery and allows for exquisitely beautiful cinematography juxtaposed with the narrative of this blossoming romance. Elio has the added blessing of having a very enlightened and open-minded family. It also helps that he has many advantages and opportunities which have given him the time he needs to explore who he is as a person. The acting is effortless and extraordinary. While Timothée Chalamet and Armie Hammer are brilliant together, it is Chalamet who is truly the standout. He is able to convey such maturity, emotion, and finesse for a relatively new actor. There are no less than four scenes where Chalamet as Elio displays such raw passion that I struggled to fight back tears, only to eventually lose the battle. Michael Stuhlbarg, who we think is one of the best character actors working in Hollywood today, gets to deliver the performance of his career as Elio's father. We sat watching his performance, taking it all in until he starts giving a very specific speech, one that left me crying one of those cries you can feel all the way in the back of your throat. Stuhlbarg manages to make an in-depth, multi-layered supporting performance look easy, and his monologue is easily one of the best scenes in the film. We saw this movie over a month ago at the San Diego International Film Festival, and I have thought about it every single day since then. BigJ was not as emotionally affected by this film as he had hoped he would have been, though that may change if we see it again. "Call Me by Your Name" is one of my favorite movies of the year. We both agree it is brilliantly acted and has a splendid, fitting, intimate musical score. It is impeccably and beautifully shot. It is moving and romantic but is also painful and heartbreaking as hell. It is about one of those loves you feel so deeply in your bones that it will shatter and crush you to think of it ending. Take a chance on the romance, the lust, the hurt, and the sorrow of "Call Me by Your Name."